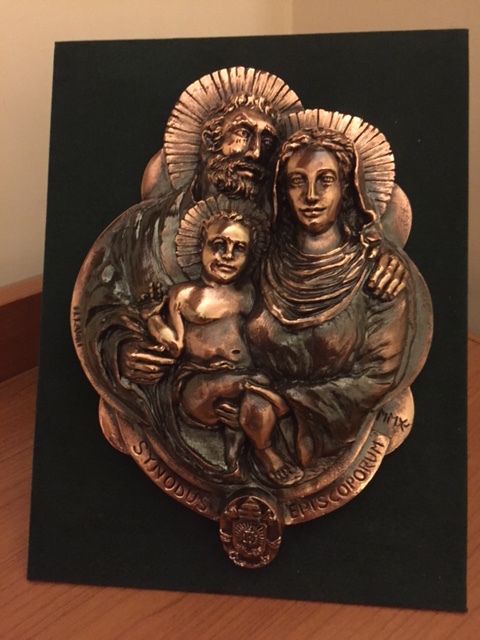 Here’s one of the commemorative gifts we were given – a rather lovely image in metal of the Holy Family. The end is nigh. Upon entering the Synod Hall and until we began the prayer, I sensed a mood of restlessness tinged with frivolity as we looked to start the last day. There was a lot of movement, much chattering, a fair bit of laughter. At last we were to see the definitive version of the final document. This makes for Synodal excitement. Mind you, the excitement was tempered by a chorus of coughing, with God knows how many bishops stricken (as I am) by some sort of cold. At one stage I felt like standing up and conducting the orchestra; there was so much coughing we could’ve attempted Beethoven’s Fifth. All we would’ve needed was the odd sneeze or loud nose blow. They came later. At the appointed time, the young, black-clad clergy who serve as assistants walked in quasi-liturgical procession down the aisles of the Hall carrying piles of a fat document. These they solemnly handed to eager bishops who received them with trembling hand, passing them quickly along the rows. It was a bit like when the exam papers were handed out back in the years when we were doing exams. We couldn’t wait to see the questions. Then we began the reading which took the whole morning. There’d been some rabble-rousing discussion before the session about the method we’d follow. It’d been decided that we would read the entire document through in the morning and then vote on each of its 94 paragraphs in the afternoon. Some subversives thought it might be better to read a paragraph and then vote on it while it was still fresh in the mind. But no: we would stick with the chosen method. So all morning we listened to the text and were even late for lunch. But at least for the reading there was instantaneous translation which was a boon after the document itself appeared only in Italian. The first of the document’s three parts was read in Italian by the president of the day, the Brazilian Cardinal Raymundo Damasceno Assis. He struggled through the text with a heavy Brazilian/Portuguese accent and a less than perfect familiarity with Italian. When he got to the end of Part I, he was clapped off stage as we looked to the General Relator, the Hungarian Cardinal Erdo, to read the second part, which he did with more assurance and less accent. He too was clapped off stage as the reader of the third part was announced as the Italian Archbishop Bruno Forte. At least a native would read the long and potentially controversial Part III where the hot-button issues are treated. He read with a fluency which became breakneck speed as we headed for lunch. He was reading the play well. At 12.30pm Archbishop Forte paused to ask the Secretary General if we should perhaps break and resume the reading in the afternoon. But no, said Cardinal Baldisseri, let’s push on to the end. A stifled half-groan didn’t threaten this time to become mutiny. We wanted to finish more than we wanted to eat. At the end of the reading of the first two parts, there was polite but genuine applause – mostly in recognition of the extraordinary effort required to put this text together in the time allotted. But when the whole document was finished by 12.55pm there was loud and sustained applause which signalled a mix of appreciation and relief. The General Relator rose to tell us that this text had been unanimously approved by the 10-man writing Commission and then promptly sat down. More applause. 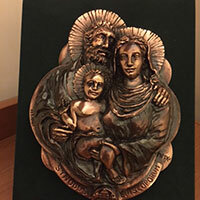 Here’s another of the gifts we received – a beautifully crafted medallion to commemorate the 50 years of the Synod. It shows the Risen Christ surrounded by the Apostles. On the back are the coats of arms of Paul VI and Francis. 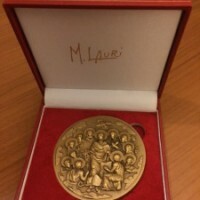 The Secretary General then rose to tell us that the Holy Father had decided to give us a gift. Now there were cries of joy – with Pope Francis gesturing from the front that it was something to drink. But no. 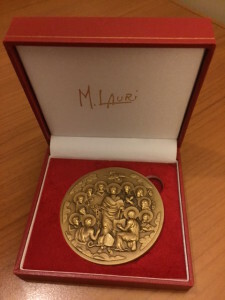 We were told that the Holy Father was offering not one commemorative gift but three – an artwork representing the Holy Family, a medal commemorating the 50 years of the Synod and a book (the title of which I didn’t catch – I don’t think it was a second copy of Cardinal Baldisseri’s latest). Not a drink in sight, but much applause greeted this proclamation of papal bounty. Many took their gifts (for which you have to sign) as they left the Hall downstairs. I’ll get mine this afternoon. I was in too much of a rush for lunch. Between lunch and the resumption of proceedings at 4.30pm we should (we were instructed) carefully re-read and ponder the text so that we’ll be ready for the voting this afternoon. I thought we might do better to get on our knees and pray that the technology works this time – 94 votes with malfunctioning technology is a fate too awful to contemplate. But worse has happened in Italy. The Italians are the masters of the art of improvisation; and my theory is that they contrive situations where they need to improvise and so can strut their stuff. Others have a nervous breakdown, but the Italians rise serenely to the challenge and pull it off against all the odds. This afternoon they may make sure that the technology doesn’t work. But they’ll pull it off and we’ll still get to dinner on time. But the big questions are: Will Pope Francis speak at the end? And, if he does, what will he say? This entry was posted in Synod2015 on October 25, 2015 by ACBC Communications.